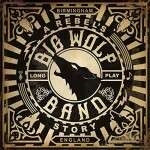 Share the post "Album review: BIG WOLF BAND – A Rebel’s Story"
In this age of instant downloads, there’s something reassuring about a Brummy blues-rock band with well crafted songs, deep grooves, tight arrangements and inspired playing fuelled by plenty of passion. Big Wolf Band come from an underrated greater Birmingham live scene that has been sustained by bands such as Rebecca Downes, Brothers Groove, Steve Ajao Blues Giants, the rockier Vincent Flatts Final Drive, Slowburner and always Steve Gibbons, though you can doubtless add your own favourites. ‘A Rebel’s Story’ isn’t going to send shock waves around the world, but it beguiles the listener with the old school values of tasteful songs played with commitment and spark. And while vocalist/guitarist and songwriter Jonathan Earp is the driving force behind this stylish power trio, the band fully contributes to concise arrangements that are stretched out with real feel and come stamped with their own DNA. Co-produced by Mad Hat studio’s owner Mark V. Stuart and the sometime Magnum production team of Stuart and Sheena Sear, ’A Rebel’s Story’ benefits from a crisp production, a pristine sonic presence and a fine band performance that sounds as if they’ve waited a long time to cut their own material. Guitarist Jonathan Earp aims high with his vocal phrasing on a subtle balance of retro and contemporary blues-rock influences. On the one had there’s a definite 70′s feel that evokes the likes of Cream, Bad Company, Gary Moore and even Peter Green, while tracks such as the lilting shuffle of ‘Done Wrong By You’ sounds very much in the present, and is boosted by some busy piano from Emma Jonson. Big Wolf Band sound at home in the studio. They let their music breathe, the solos fly and front man Earp brings heartfelt expression to bear on his own lyrics. Big Wolf Band also sound very much like Cornish blues-rockers Blacktop Deluxe, who share the Wolf’s adherence to recycling retro blues-rock influences in a contemporary context of self penned material. Even the more mundane lyrics on ‘Hot Blooded Woman’ are brushed aside by some fine playing and stop-time guitar breaks over the tight rhythm section of drummer Tim Jones and bassist Mick Jeynes. Having read the CD liner notes it comes as no surprise to discover Brothers Groove bassist Deano Bass in the mix, as he fits the band’s musical oeuvre perfectly. Big Wolf Band find their own subtle equilibrium by getting inside the songs by amplifying the grooves and improvising when the moment demands it. As always with a blues related band, the ultimate barometer of their ability is how they deal with a slow blues. And they step up to the mark on ‘Darkest Of My Days’ which features one of Earp’s best vocals and some studied Gary Moore style guitar. He’s equally good on the subtly nuanced drifting blues of ‘If I Ever Loved Another Woman’. The song builds imperiously and resolves itself on a flurry of notes that cut through a swinging arrangement, punctuated by Tim Jones’s extravagant cymbal splashes before a feather light drop-down. On the rolling piano-led, boogie inflected ‘Long Time Mary’, Earp almost over sings with a slightly jarring vocal. Happily it’s counter-weighted by the way the band leans into the groove while leaving plenty of space for both Jonson’s piano and Earp’s warm toned solo. The band also stretches out on uplifting rock-blues of ‘Rolling With Thunder’. Significantly it comes at the mid-way point of an album that gradually reveals its inner core and flows mellifluously as vinyl records used to do. The title track is a funky departure with distant echoes of Paul Kossoff and Albert Collins. You could imagine this being a live favourite as it lends itself to the kind of extemporization that Earp surprisingly explores sparingly. It’s a good example of the band’s adherence to the strength of the material rather than focussing on their own ability to rock out. This approach gives the album its discernible identity. The more you play it, the more the subtle dynamics, underlying grooves and uplifting solos reveal themselves and sucker you into hitting the repeat play button. Listen for example, to the extra little push on ‘Been Here Too Long’, which ushers in an expansive solo that always remains an integral part of the song. There’s diversity too on ‘Love Isn’t Free’, which has southern rock vibe with a familiar narrative and strong lead and bv’s. The song racks up the tension and Earp’s solo acts as a siphon on a track that finishes all too soon. Big Wolf Band admirably live up to their name. They are a big sounding, enveloping and hungry band, who shift from playing within themselves to cutting loose on strong self penned blues-rock material given it’s sheen by an intuitive production. This entry was posted in ALBUM REVIEWS, ALBUM REVIEWS (Mobile), All Posts and tagged A Rebel's Story, Albert Collins, album, Bad Company, Big Wolf Band, Birmingham, Blacktop Deluxe, blues, Brothers Groove, Cream, Deano Bass, Emma Jonson, funk, Gary Moore, Jonathan Earp, Mad Hat Studios, Magnum, Mark V Stuart, Mick jeynes, Paul Kossoff, Peter Green, Rebecca Downs, review, rock, Sheena Sear, Slowburner, Steve Ajao Blues Giants, Steve Gibbons, Tim Jones, Vincent Flatts Final Drive Final Drive. Bookmark the permalink.